A scandal is growing over the involvement of a top advisor to the president of Kyrgzstan's involvement in a multi-billion international fraud scheme in Italy. The involvement of President Bakiev's advisor, Eugene Gourevitch, 33, in the scheme is now threatening the stability of the current Kyrgyz Government's already shaky footing. Soviet born Gourevitch, who later acquired US citizenship, now represents the MGN-Kyrgyzstan investment hub, which controls major industries of Kyrgyz economy. Critics of President Bakiev insist that his son, Maxim Bakiev, the newly appointed head of the Development and Innovation Agency of Kyrgyzstan, has close ties to Gourevitch. They argue that these ties were the main reason for MGN's unlimited powers over strategic sectors of Kyrgyz economy, despite opposition protest. Reuters first broke the story of Gourevitch's problems with Italian law on March 9, 2010. As Reuters reported, Rome Judge Aldo Morgigni issued an arrest warrant for Eugene Gourevitch indicating his involvement in an "astonishing US$2.7 billion fraud activity of the wholesale telephony divisions of Telecom Italia SpA and Fastweb SpA between 2003 and 2006." 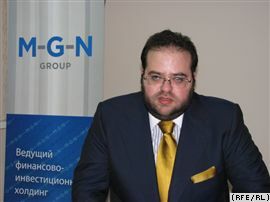 Further, Reuters reported that "Gourevitch is being charged with criminal conspiracy and money laundering, Judge Morgigni alleged the U.S. citizen had 'created, managed and used... a series of companies through which he moved an enormous quantity of money constituting the "cuts" destined for the various members of the conspiracy.'" As the Reuters story spread on the Web -- from Kyrgyz and Russian news outlets like Azattyk.kg (RFE/RL branch), Fergana.ru, Centrasia.ru to social media like Twitter and Facebook -- attention focused on Kyrgystan's president. Since the discussion of the Gourevitch story exploded online, Newrasia.net bloggers in Kyrgyzstan found that independent Web sites that expressed opinions critical of Kyrgyz Government were blocked within the country. This included sites that were available "just a couple of days" before, like RFE/RL branch in the country Azattyk.kg. On March 10, Gourevitch's representative in Bishkek city, Kyrgyzstan, held a press conference for local media denying any involvement in the criminal activity he was accused of by Italian authorities. RFE/RL Kyrgyz branch Azattyk.kg reported Gourevitch's resignation from MGN-Kyrgyzstan management in response to the growing scandal. Defiant opposition parties have been accusing President Bakiev of rigging the 2009 presidential elections while consolidating executive power in the country with his direct role in diminishing rights and freedoms in central Asian republic.